Felix R has a 5-Star rating and leads the company in total reviews, making this pro a ReviewBuzz Rockstar! Felix showed up on time and was very professional and personable. We spent a lot of time evaluating our options as there was more than one solution and he was upfront on pricing before the work was performed. He also waited for a few minutes so I could check with the buyers of the property regarding the options / solution so I didn't have to incur another service call at a later date. Thanks Felix for the good service! Felix was great. Courteous, efficient and neat. You can tell he takes pride in his job. Last night we needed to call The Pink Plumber do to a bad leak from our water heater. They were quick in getting someone to our home. Technician, Felix Rivera called us back and notified us that he would be at our home within 1/2 hour. He came to our home and explained what the issue was. Felix was knowledgeable and courteous while we were asking questions. Felix also advised that we had a leak in the main valve to our house but could not fix it last night, but would come Saturday. Felix came back today to fix the main water valve to our home. Anyone needing a plumber, I recommend The Pink Plumber and would ask for Felix Rivera. Callled Pink Plumber's hotline and asked if we could have a plumber come for a water leak in our garage. Felix Rivera, called us back relatively quick and said he is on his way. Felix Rivera assessed the problem. We needed a water heater. He searched for a great price and gave us a great discount. He was courteous and gave his full attention while we asked questions and was knowledgeable and his work was neat. This is our second time using Pink Plumber and satisfies with their service. 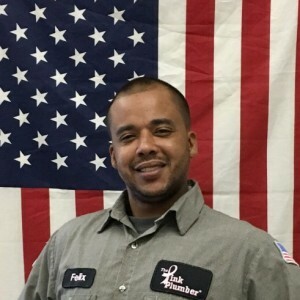 Anyone needing plumber, I would recommend The Punk Plumber and would recommend Felix Rivera. Charged $245 Diagnosis fee results in absolutely wrong diagnosis. Suggested replacing a $30 part but job would be $650 come to find out that diagnosis was totally wrong and the problem is in an entirely different place and the suggested part need NO replacement. Job was done for $150.00 Outright rip off. Wonderful experience with this company. Prompt, courteous, and professional. Helped get my townhouse functioning properly after problems with my GC. Love that a portion of the charges go to help breast cancer. Marat was great! Will definitely use again and recommend. Had Felix out to hydro clean our main sewer drain and although the cost was a bit high we are certainly pleased with his efforts and would recommend this Co. for all your plumbing needs. The technician, Felix, was professional, knowledgeable and courteous. He got right to work and explained everything he was doing as he went along in an understandable way. He arrived promptly at the scheduled time both days and he took the time to do a thorough job to locate and correct my problems. The service has so far seemed to resolve my problem. I will definitely call Felix and the pink plumber if i have any future plumbing needs. Felix was very professional and helped us solve our plumbing issue. This is the second time I have use the Pink Plumber and I was very satisfied. ast, reliable service! Needed a new water heater ASAP. Called at lunch on Friday and they had a tech out in less than 2 hours and the project completed that day. Our tech, Felix, was polite, descriptive and knowledgeable. We had never replaced a water heater so he was sure to explain every detail and show us exactly what needed to be done. Not only did we feel confident in his recommendations, we also felt good about his suggestions to change out the old PVC pipes to the heater with new better material and valve that will last longer and reduce up keep in the future. Overall I was very happy with the service from the time I called customer to the final job sign off. I liked that all the paperwork was done digitally and that I received an email with my invoice and photos of the before and after. I would recommend The Pink Plumber and Felix. Felix came to our house to check out an issue in our garage with our gas water heater. He did a great job and was very helpful throughout the whole process. He explained everything in detail and we felt very comfortable through the replacement of our water heater. He stayed till nearly 9pm on a Friday night to get the job done so we didn't have to wait over the weekend. Would highly recommend this company and would call them again for other plumbing services. Thanks again Felix!! Felix was excellent! I had an emergency situation due to plumbing issues and he came out after midnight to try and fix the problem. He was able to diagnose the problem and came back that morning to fix it. He had to add new pipes, a job that normally takes maybe 2 days, and was able to get it completed in one day! I would highly recommend Felix Rivera for any of your plumbing needs. He is reliable and will get the job done! Very well. They did an excellent job! Felix R. was very professional and knowledgeable. I would highly recommend him to anyone. Great job!!!! Thanks again.